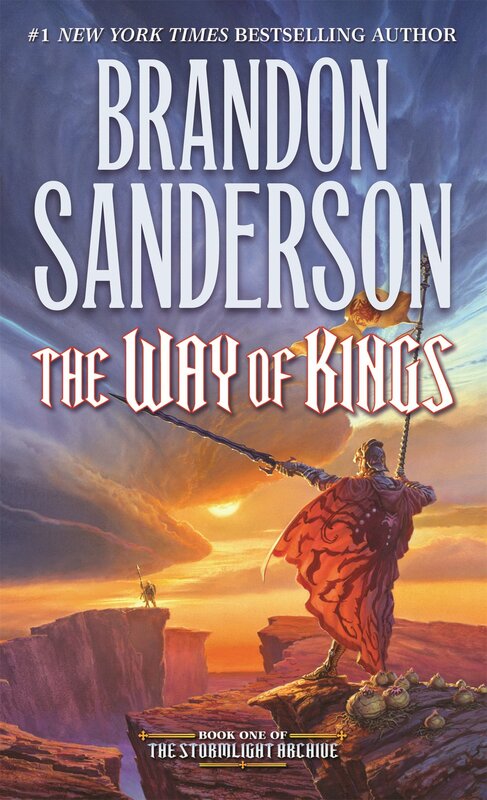 A friend who is also a big fantasy reader had been raving about — and trying to get me to read — the first book of Brandon Sanderson’s Stormlight Archive series for some time. I was a bit skeptical because I’d tried Mistborn, also by Sanderson, a few years back and been unimpressed, but my friend was insistent. Eventually I realized it was in the best interests of my ongoing health to simply acquiesce and let her lend me the damn book. After all her raving, I was expecting The Way of Kings to be something really different and original. Certainly the setting is unusual. Way of Kings takes place in a world that is constantly lashed by titanic “Highstorms,” and all of the plant and animal life has evolved along strange, exotic lines to survive this brutal environment. However, when you get down to the bones of the story, Way of Kings is a very classical, almost generic, high fantasy epic. And I could not be happier about that. Way of Kings feels just like the books I grew up reading and loving: Lord of the Rings, Shannara, Obsidian, and the like. Ancient evils return to swallow the world, and heroes rise to fight them. The characters all feel very familiar, almost cliche — a nobleman chosen by the divine to redeem his people, a slave fighting to survive against brutal oppression — but you know what? Some things are cliches for a reason. It works. They’re characters that I want to cheer for. They’re characters I want to see succeed. Similarly, the meta-plot thus far feels like the sort of thing I’ve seen before, but it’s a story that I like. It feels epic. It feels meaningful. The fate of the world is on the line, and the stakes couldn’t be higher. This is exactly what I look for in fantasy: big ideas, big threats, epic conflicts with mighty heroes standing to save what they hold dear. It’s not a perfect book. It does inherit one sin from the old school fantasy it’s clearly emulating: It has a very slow start. For those with the patience to persevere, Way of Kings eventually becomes very exciting, but it does take its time getting there. I think the author could have spaced out the big reveals a little better such that there isn’t more happening in the last hundred pages than in the first six hundred. And sometimes he gets a bit too bogged down in details. He has an odd obsession with describing every article of clothing worn by every character in excruciating detail, and it gets wearing after a while. Finally, one of the main characters — a scholarly girl named Shallan — has thus far failed to capture my interest. Her story is as cliche as the others, but her cliches aren’t cliches that I ever liked in the first place. I’ve kind of had my fill of “tough but fair” mentor characters, among other eye-rollingly predictable choices that are too spoilery to get into. That said, I wasn’t immediately impressed by the other characters, either, so there may be hope for Shallan to redeem herself later in the series. And don’t let my complaints detract from the fact that this is a strong book. Considering it’s twelve hundred pages long, the pacing is actually a lot better than you’d expect, and again, it does eventually become very gripping. Those of us who are fantasy fans are used to slow starts, so I don’t think anyone in this book’s target audience will consider this an unforgivable sin. If you are a fan of traditional high fantasy, I definitely think that The Way of Kings belongs on your reading list. The next 2 books go a long way in improving Shallan’s character. Part of it is that Shallan has to make her own way in the world, and she rises to the challenge, but part of it comes from her accepting who she really is and what she really wants to do. I’m in complete agreement about it starting slow… I’ve never re-read the whole book, but I’ve re-read the final 100 pages (well… 107, I think) probably 7 or 8 times. Overall I quite enjoy it. My friend also assures me Shallan will get more interesting. She was right about Kaladin (whom I didn’t like out of the gate but who became my favourite character in time), so I’m maintaining a cautious optimism.